I know what you're probably thinking. Yes I'm still alive and yes, I still write for The Oregon Wine Blog. Where have I been? I have a new job, moved to Portland, and have been bouncing back and forth from Corvallis. Expect more frequent writing and a whole lot more articles about wineries and events in the Portland area. Now that that's out of the way, let's get to the reason why I'm writing. 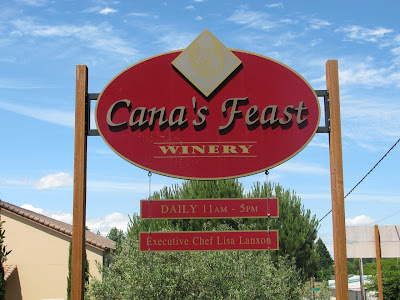 While at Edgefield's Celebration of Syrah last April, Josh and I met Patrick Taylor from Cana's Feast Winery. What immediately clicked between us was a shared viewpoint on the wine industry and how to best get younger people interested in Northwest wine. One topic lead to the next until he mentioned an event at Cana's Feast that I knew I had to be at; their Southern Mediterranean Festival. 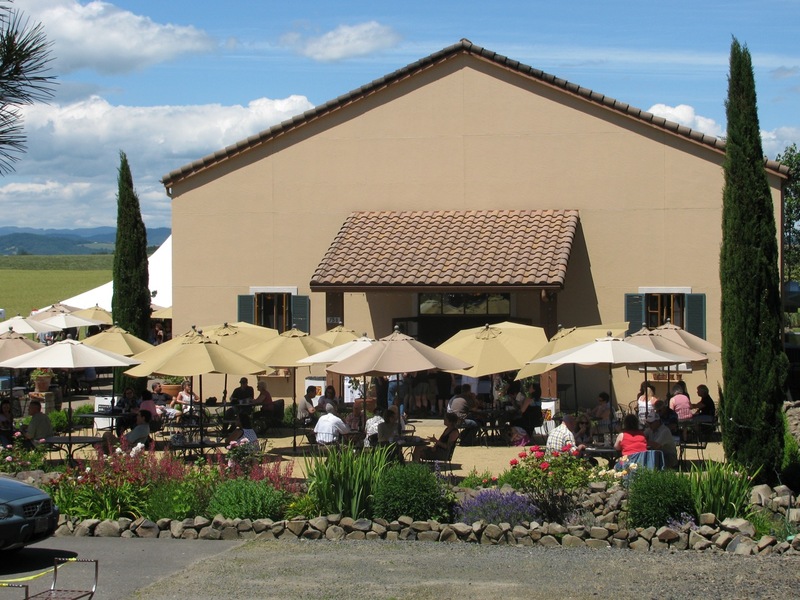 The SoMed festival is all about highlighting varietals from Southern Spain and Southern France grown specifically in Oregon. Everybody in Oregon has a pinot noir or pinot gris, but what about trempranillo, grenache, roussanne, or counoise? As a huge fan of seeing Northwest wineries try new things, it was my job as a respected wine journalist to find out. I also decided to bring my sister, Laura, with me. She had never been to a wine event before, so I figured she's the perfect person to test how an event like this is perceived from a novice wine drinker. Before I get to the wine, let me first take a moment to share a bit about Cana's Feast and its property. 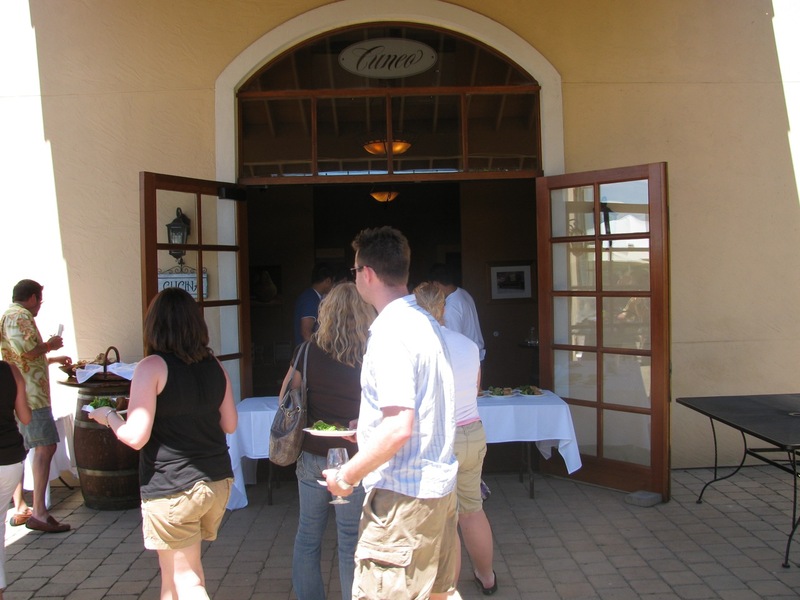 Located in Carlton, Cana's Feast is immediately distinguishable by it's beautiful Spanish-themed tasting room / wine making facility / restaurant. This happened to be one of the most beautiful days of the year, so I was immediately excited to see the outdoor tents and seating areas. I didn't get a chance to check out most of the indoor facilities due to the event being outside, so let's get to the wine! My first stop was at Grochau Cellars' station where Laura and I tasted their 2007 tempranillo and 2008 Tinto (tempranillo/syrah blend). Both wines were great with Laura preferring the tempranillo and myself liking the Tinto just a tad more. Both are very affordable and I'd highly recommend picking up either. The wine aside, we also had a chance to chat with Grochau's winemaker, Carl Giavanti. I hadn't heard of their winery before and having just moved to the Portland area the day before, I was excited to hear that their tasting room is located downtown at NW Industrial St. and NW 30th Ave. I haven't hit up any urban wineries yet, but give me a few months and I'll be giving Clive a run for his money. Carl was incredibly hospitable and did a great job explaining to my sister what each wine was in easy to understand terms and in a very non-intimidating way. This is the kind of thing I love from wineries and I'll definitely be hitting up their tasting room soon with some friends. While the roasted vegetable sandwich looked good, we both went with option #1. I'm so glad we did because both items were absolutely delicious. Laura doesn't even like fish and she really dug the salt cod croqueta. After talking with their catering staff a bit and looking at their menu online, I'm definitely going to have to stop by for dinner soon. Aside from being a cool guy, he also makes some phenomenal wine. We both tasted his counoise and agreed that it was our favorite for the day. Not too bold, not too fruity, but a perfect mix of everything that would make it phenomenal by itself or with a meal. I also enjoyed how Laura pronounced it similar to "mayonnaise." In short, The Southern Mediterranean Festival was a really fun event that let us try some small production Oregon wines. Tons of people came out and I can't imagine it not being a huge success for Cana's Feast. I highly suggest stopping by their winery and attending their Italy In The Valley event in August. And to think, I went to Texas instead of this event. Sounds like we need to reevaluate my critical thinking skills. Or, eat more donuts and wine.